Combining the old with the new and the 2 most popular trainers, the Nike Air Force 1 and the Nike Flyknit a whole new world of comfort has been created.The Air Force 1 as popular as it is is a heavier sneaker compared to others so the weightless feel to the classic silhouette combined with its modern Fly knit technology is a huge success. 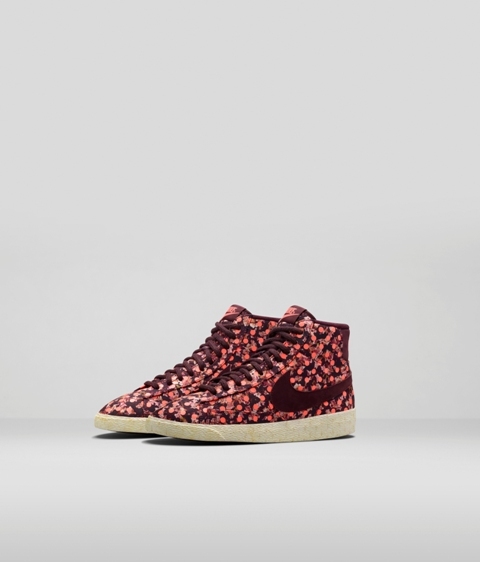 The Nike Sportswear team took their inspiration from long walks through Paris deciding they could make the shoe lighter, more flexible and reducing that dreaded crease along the toe vamp. 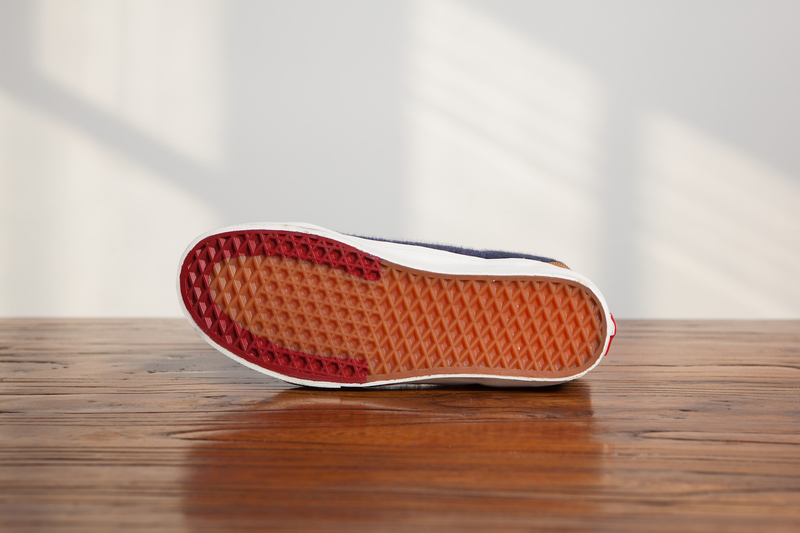 By using injected unit rubber tooling instead of polyurethane tooling and micro-engineering each stitch they created the featherweight upper for “maximum comfort and minimal weight”. The wait is almost over and we can reveal that the Nike x Liberty AW14 collection is launching on Tuesday 2nd December. 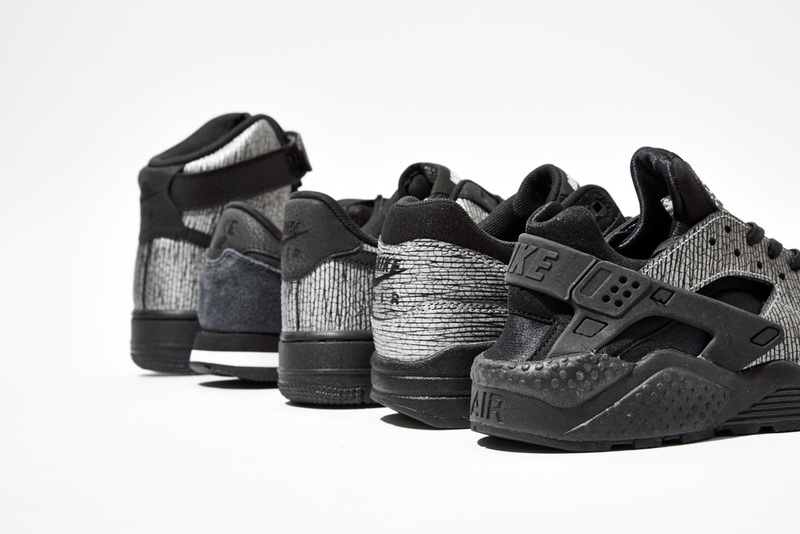 The collection showcases a mix of Nike’s favourite styles and 3 new sneakerboot versions to blend the old with the contemporary. 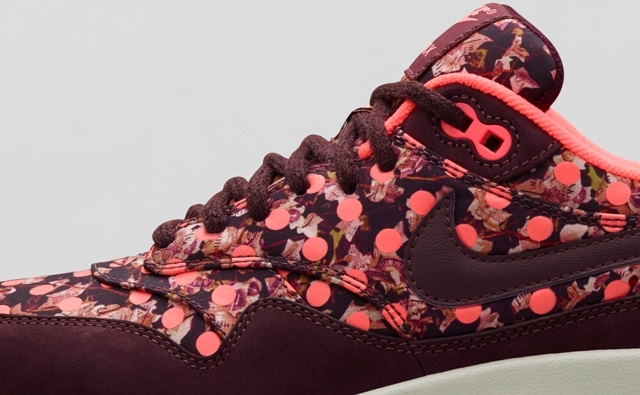 This is also reflected in the archive print used as Nike has updated the heritage Belmont Ivy print with an overlay of polka dots. 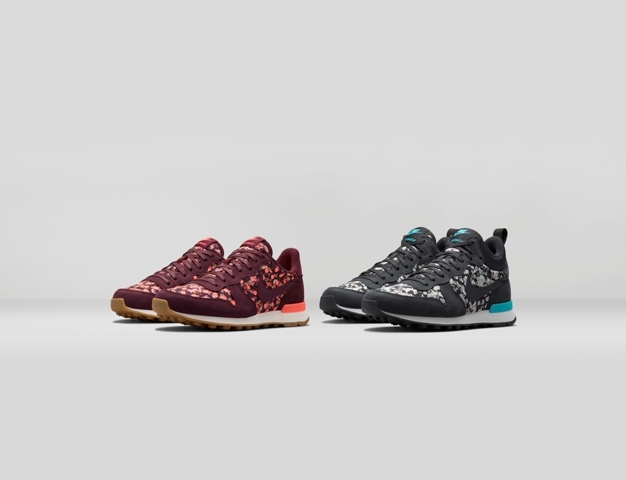 The hero of the hour is of course the iconic Air Max 1, a style that epitomises classic Nike and is a firm favourite in every Nike x Liberty collection in which it has featured. 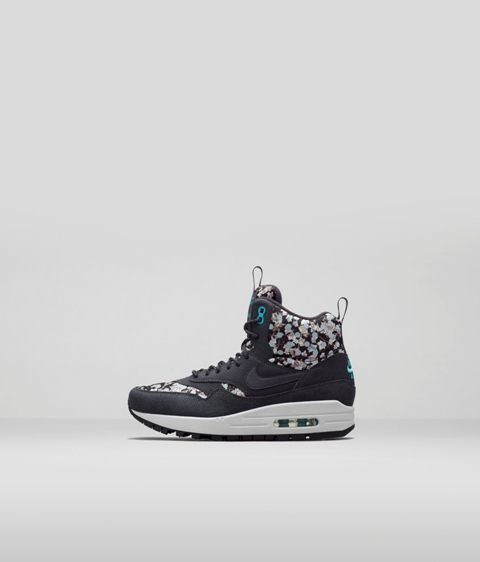 The dark blue version of the print adorns the updated Air Max 1 Sneakerboot, taking the style higher with a padded ankle support. First released in 1972, the Blazer had a huge revival 3 years ago and we still love this clean cut, vintage silhouette. 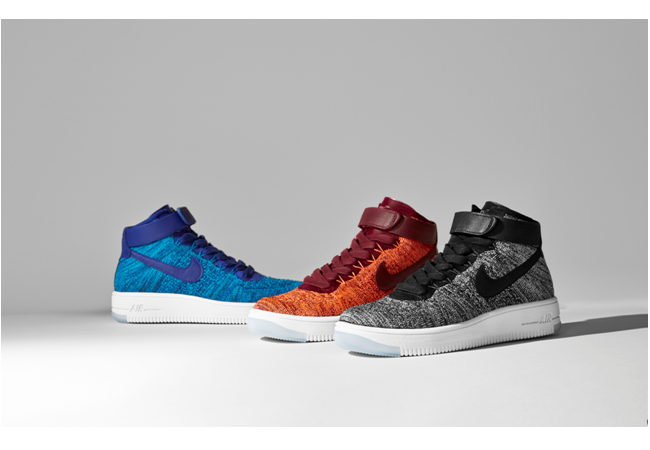 With running styles fully represented, it makes sense to add a bit of basketball with the iconic Air Force 1. 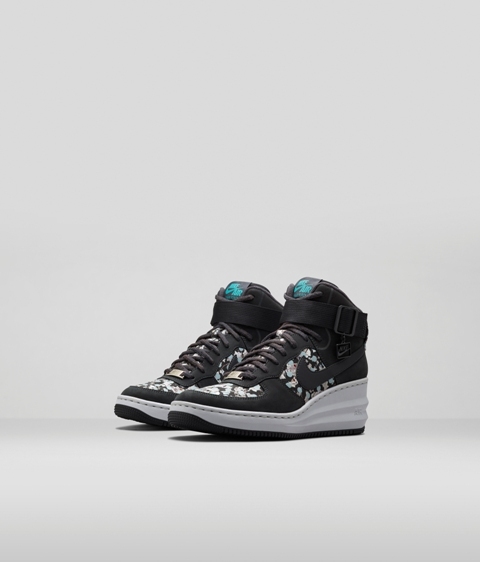 With wedge trainers still a favourite for women, Nike have updated the Air Force 1 with this Lunar Force 1 Sky Hi, slimming it down and adding a heeled Lunar sole. Last year saw the return of the Internationalist and since then we can’t get enough of it, so it made sense for Nike to give us the option of the classic and the new Mid, sneakerboot update. This collection will launch in-store and online here on Tuesday 2nd December. Another innovative pack from sporting heavyweights Nike, showcasing a collection that takes inspiration from Louisiana, also known as Crescent City. Year after year, the US basketball league’s best come together to compete for bragging rights in a showcase of premier talent and this year’s festivities are held in the heart of New Orleans. 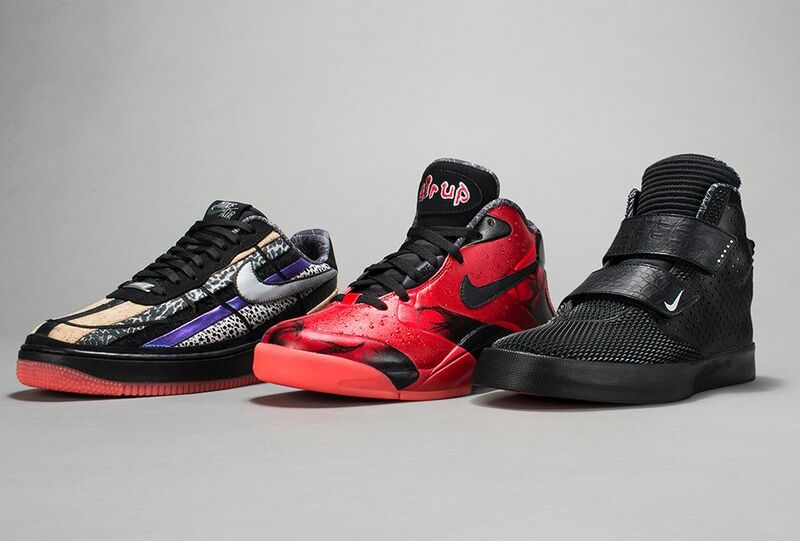 As the NOLA Gumbo League Collection pays homage to what happens on the hardwood, the Nike Sportswear Crescent City Collection showcases the characteristics that make New Orleans different from anywhere else: the food, culture and distinctive wildlife. 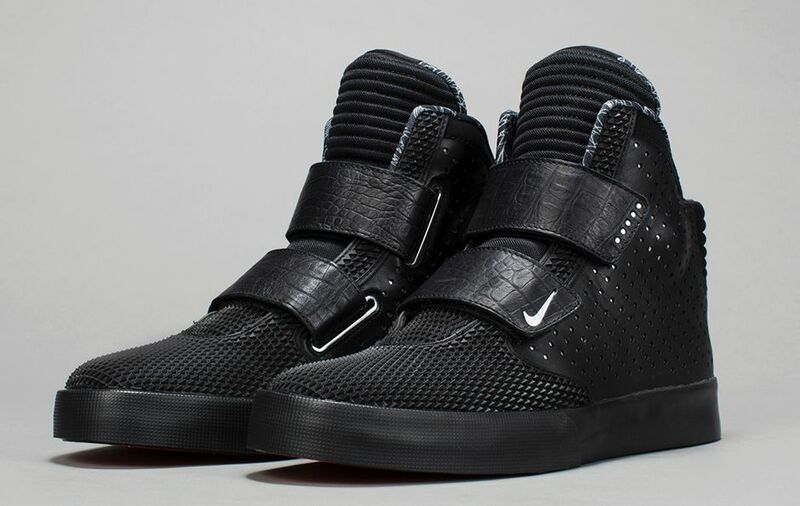 These three qualities take centre stage on Nike’s Flystepper 2K3, Air Up ’14, and Air Force 1 Low Comfort, designs as unique as the city that inspired them. In New Orleans, alligators are king of the land and remembrance of another king’s first pair of Nike’s, the Flystepper 2K3 combines an elevated silhouette and adds the signature perforated quarter panels of the Zoom 2K3. Featuring black faux-alligator strap enclosures, the real tribute to the tough skin of Alligator Mississippi takes form in a raised synthetic mesh covering the toe. As the best of the best come together in the Big Easy, the Nike Air Force 1 Low Comfort pays tribute in kind. 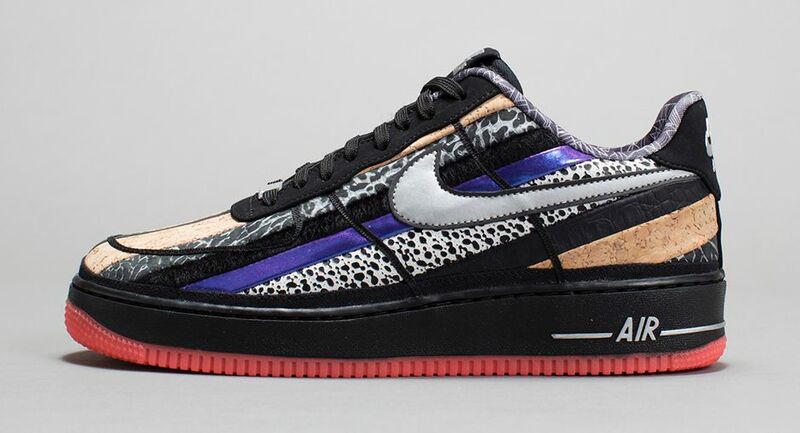 Like Louisiana’s favourite dish, gumbo, the latest Air Force 1 is a collage of the most memorable Nike Sportswear upper materials,such as foamposite and cork and prints including elephant, alligator, pony hair, and safari. Crawfish are a NOLA staple and any New Orleanian will tell you they are best when boiled. A crave-worthy take on the Nike Air Up mimics fresh-out-of-the-pot crawfish. 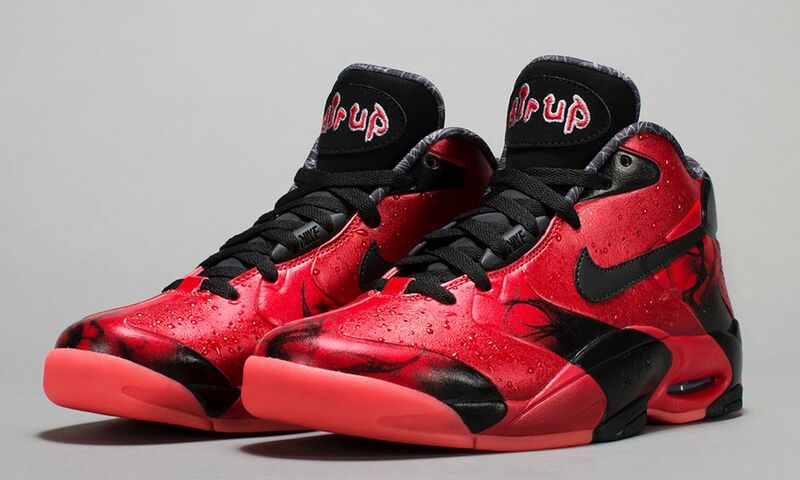 The Air Up 2014 gets the job done with no seasoning required, featuring a crustacean-red upper complete with water droplets and a steamy graphic. Get your hands on the Quickstrike styles from this limited and unique pack online here and in selected Offspring stores. Check your local Offspring store for availability.